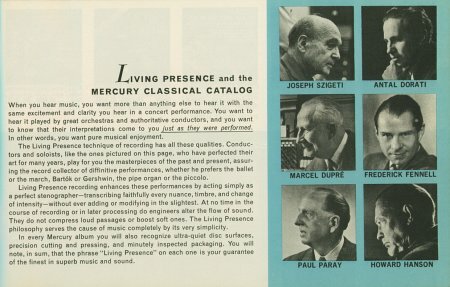 This page introduces several important releases other than original Mercury issues, and historically important materials. Basically this site doesn't cover other releases than US ones, but some may be important in some sense. I'm including some of them here. By Mister Kiyoshi Koyama's devoted and detailed investigation, we now can enjoy many great unreleased recordings. Upon this research, in 1983 Nippon Phonogram Records started to release them in Japan. Most of the releases are just straight re-issues, digitally remastered from original master tapes, but some of them are great compilations of unreleased materials. Nowadays, most of such unreleased recordings are included in CD reissues, but this Nippon Phonogram series played an important role as a whole. Miscellaneous materials which gives us many important information. This is a eight-folded small pamphlet, maybe for promotional use. 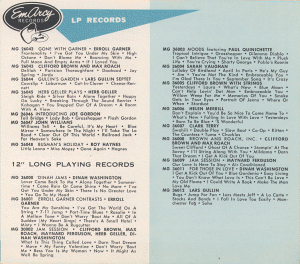 This pamphlet includes all EmArcy releases (except 78rpm/45rpm single releases) as of June 1955. Listed titles are: EP series from EP-1-6000 to EP-1-6125; all 49 titles of 10-inch LP (from MG-26000 to MG-26048); and 12-inch LP from MG-36000 to MG-36012. This is January 25, 1956 issue of the famous magazine Down Beat. I am including this issue here, simply because it has feature articles on the EmArcy label (the articles themselves now have historical value I think). Front cover's photo is also for the special feature - Sarah Vaughan's big photo is surrounded by small photos of Terry Gibbs, Gerry Mulligan and Max Roach. Three pages (from p.12 to p.14) are dedicated to the EmArcy special feature articles. 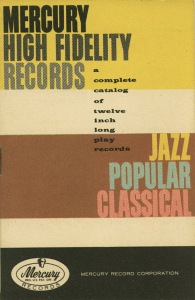 Page 12 contains biography of EmArcy artists (including Cannonball Adderley, Georgie Auld, Art Blakey, Clifford Brown, Maynard Ferguson, Ralph Gari, Herb Geller, Terry Gibbs, Lars Gullin, Eddie Heywood, Helen Merrill, Gerry Mulligan, Paul Quinichette, Max Roach, Clark Terry, Sarah Vaughan, Dinah Washington, Kitty White and John Williams). 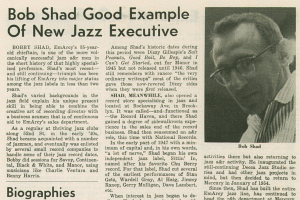 The following Page 13 features an article of Bob Shad (original producer of the EmArcy label) written by Nat Hentoff. Then the Page 14 is the future of EmArcy label, with Bob Shad's own words. 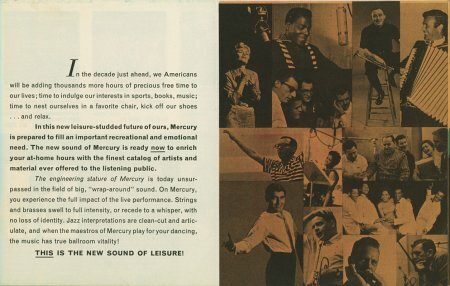 Interesting facts on these articles includes: When Bob Shad came to Mercury in 1951, he headed the R&B department of Mercury label; In 1953 he switched to Decca, then returned to Jazz A&R activity; He decided to return to Mercury in January of 1954; Since then he had built the entire EmArcy Jazz line, as well as headed the R&B department at Mercury, and furthermore he took over the Jazz and R&B functions of the original Wing label; and many more. 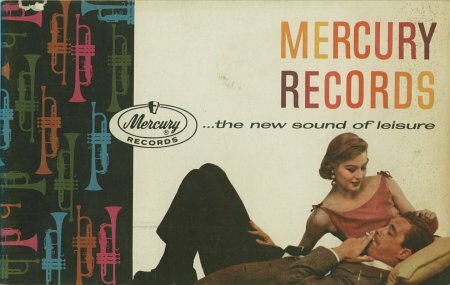 Another interesting fact is, EmArcy started to release in October 1954 (in his own words). Page 17 is the full-page advertisement of EmArcy's new releases - MG-36039, MG-36040 and MG-36044 are featured as “January Releases”, and MG-36047 as “Just Released” (newest release). Following Page 18 and Page 19 are double-page spread ads of EmArcy, featuring photographs of many EmArcy artists. Other interesting facts on this issue - a review of Wing MGW-60000 (Introducing Nat Adderley) is on the famous “Down Beat Jazz Reviews” (three-stars BTW). 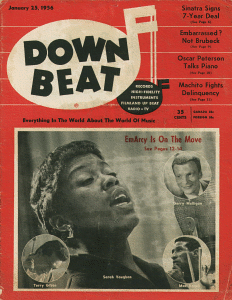 Furthermore, the editor of Down Beat magazine in this era was Jack Tracy, who later took over the EmArcy label's producer from Bob Shad, and who also was a producer of Limelight label. This is a 32-page (except cover pages) booket, maybe for promotional use. 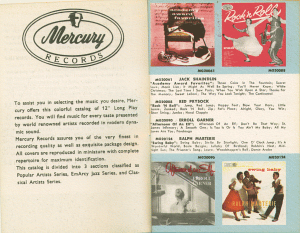 This booklet includes many title listing as well as track listing with colour photos. Judging from the titles listed on it, this might be issued circa 1957. 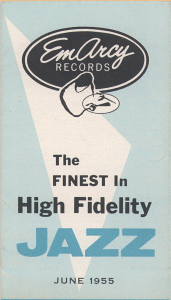 No stereo releases are not printed - this also may suggest the booklet was issued circa 1957. Although the front cover says "Complete Catalog", actually not all titles are printed and listed. I don't know the reason - it might be due to the lack of the space, or the list might be "actually being released" titles only (that is, except "discontinued" titles). First 9 pages contains a list of Mercury Popular 20000 Series, and the latest title is MG-20309 (The Diamonds). Additionally two double albums MGP 2-100 and MGP 2-101 are also listed. Following 15 pages contains a list of EmArcy Jazz 36000 Series, from MG-36002 thru MG-36103 (Swingin' With Terry Gibbs). We must note that this EmArcy listing spends the most number of pages in this booklet. The last 8 pages deals with Living Presence 50000 Series, and the latest title is MG-50132 (KODALY: Hary Janos Suite, Minneapolis Symphony, Dorati). Again, this is a 48-page (plus extra 6 pages) booket, maybe for promotional use. This booklet includes many title listing with colour/b&w cover photos. Judging from the titles listed on it, this might be issued circa 1960. The extra 6 pages, filed in the middle of the booklet, is likely the additional page, “Latest Album Releases” printed on the pages. The latest album on the additional page is MG-20592 / SR-60250. 21 pages are used for introducing Living Presence Series listing, with colour/b&w cover photo too. The latest album on this Living Presence section is MG-50260 / SR-90260. visitors to this page since November 22, 2002.